Global, European, regional and national policies, directives and regulations on harmonization of spatial data, data quality assurance, regular land cover/land use monitoring, integrated risk and territory management and security. BSDI is foreseen as an open spatial databases and operational services portal not only for Bulgaria, but also in support of trans-border and transnational bilateral and multilateral cooperation of the countries from the region of the Lower Danube, Black Sea region and later for the region of South East Europe. The concept was presented during the GMES / COPERNICUS workshops in Sofia -2010 and 2011, realized by the Bulgarian government, with the support of the European Commission, in particular - DG ENTR and DG JRC. Trans-border and trans-national operational capacity development was started under the Cross-border Cooperation program Romania-Bulgaria through a flagship project – „COMMON STRATEGY FOR SUSTAINABLE TERRITORIAL DEVELOPMENT Of THE CROSS-BORDER AREA ROMANIA-BULGARIA“ - MIS ETC Code 171. This project and the future concept, called shortly "SPATIAL" will develop the first stage harmonised common spatial data bases and user oriented operational services, jointly for Bulgaria and Romania on local, and regional level. The concept and the developed capacity will be opened to to other countries fro the region of Lower Danube, as well as for the whole Danube region under the Danube strategy. This initiative is expected to be developed in close collaboration with experts from DG ENTR – managing the European program for Earth Observation – COPERNICUS and DG JRC, as the EC mechanism for research, methodological and technological support and coordination. Collaboration with ESA, EEA and other EU structures is also welcomed. Furthermore, a procedure for establishment of intergovernmental working group for the concept of the Regional Center for Lower Danube, located in Russe is currently in progress. Such a regional network structure will strengthen and coordinate the national and local operational capacity needed for the implementation of the targets and priorities of the Sendai Framework for Disaster Risk Reduction 2015-2030. A future network and its Regional Center in Bulgaria will also support the Smart Specialization initiative set by EC - DG REGIO and DG JRC, aiming to ensure the use of EU funds is made on the basis of sound analysis and that it is targeted to the country needs in terms of strengths and weaknesses. The Smart Specialisation approach includes a clear cross - border aspect in the sense that regions need to profile themselves in their field of expertise in order to participate in the world economy. 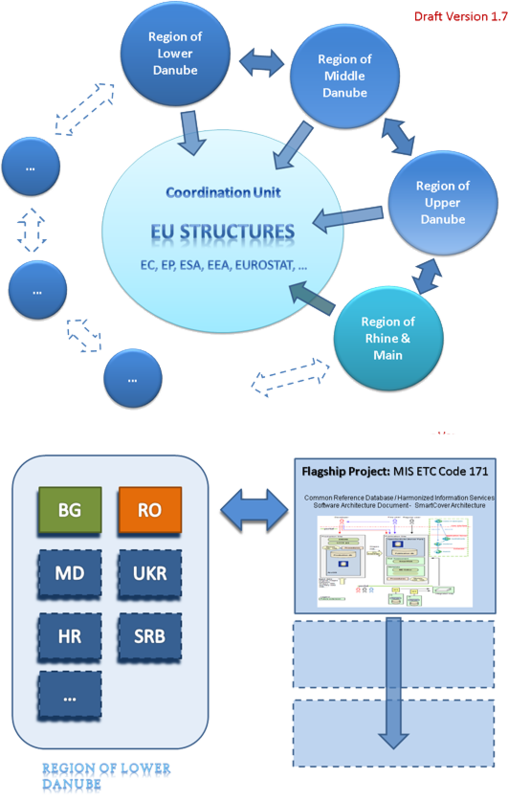 More information on Common spatial data reference layer, the initiative for the European network of regional centers, and operational services in support of the Danube Strategy, you can access from top menu "Data and Services" in support of „Europa 2020“, "Services in support to Danube Strategy". The integration of information from satellite images with various other data layers allows to synchronize a variety of data to verify their reliability, to update and create the opportunity to provide the basis/foundation of effective and sustainable management. Joint use of data from space and from in-situ sources, and also the continued monitoring of the land (land cover and land use), ensures security and reliability of the information, services, that are oriented towards end users and effective results of the accompanied analysis, predictive models and assessments. In the beginning the idea was launched with the adoption of the Decision of the Council of Ministers of the Republic of Bulgaria - 761 of 2004, to build a unified national database. Извлечение от Протокол №29, от заседанието на МС, от 24.07.2013 г.
Решение на МС, №826, от 16.11.2011 г. The initiative was started as part of the framework/collaborative agreement between the State Agency for Information Technologies and Communications, transformed into Executive Agency for Electronic Communications Networks and Information Systems (ESMIS) to Ministry of Transport Information Technologies and Communications and the Agency for Sustainable Development and Eurointegration - ECOREGIONS (ASDE), as well as implementation of the tasks of the agreement between ASDE and the Joint Research Centre (JRC) of the European Commission. Later a consortium, including scientific and university structures, research and development organizations, NGO,s , SME,s was established , under the name of Bulgarian Information Office for Earth Observation-GMES/Copernicus. Technical support from the Institute for protection and security of citizens – EC - DG JRC-IPSC was provided for the geo-portal infrastructure. One of the main targets of the geo-portal is to support the development of an experimental common geo-database (space and in-situ) component from and for research tasks and projects, including the 7th Framework Programme of the European Union and Structural Funds. One of the objectives is to facilitate and accelerate the implementation of requirements 02/07/EO Directive of the European Parliament and the Council for establishing an Infrastructure for Spatial Information in the European Community (INSPIRE). In the development and upgrading/building of the experimental portal are included experts from several research institutes, research and civil organizations, universities, business structures, united in the Bulgarian Information Office for Earth Observation - GMES / COPERNICUS (BIOG). The experimental geo-portal is user friendly based. Besides the capacity of diverse thematic maps, attributive tables with text data are also included. In addition for more and varied information relations a hyperlinks to other websites, like Wikipedia are provided. The user can open various thematic maps and observe satellite imageries from any vector layer, attached to the map of Bulgaria. To facilitate users in introducing the names of searching items, the data are organized and simplified so that are easily selectable. They can also be selected as linear and polygon vector objects. The database will be constantly supplemented with new layers of information that will come from various government, academic and municipal structures. They will be timely filed in electronic form with some extent of tolerance. Since the geo-portal is still under construction and synchronization of the connection to the different sources of information, direct access to it is provided only to ESMIS – Executive Agency "Electronic communications networks and information systems". In the near future will be provide a link with the Ministry of Transport and Ministry of Regional Development, the Ministry of Environment and Ministry of Agriculture and Food and other benefitieries. At the next stage will be included a possibility for non-government organizations and companies to access the data via the terms and using conditions. Each stage of the development of the system will be implemented in partnership with experts from relevant ministries, in accordance with the requirements of Directive 02/07/EO, but also with a real possibility and scope of the data. The task is realized by a team of specialists from ASDE and Remote sensing application center (ReSAC). Еxperts from the Bulgarian Academy of Science institutes and from Sofia University "St. Kliment Ohridski" are involved in different activities. Support in this task, was provided by partners within the Commission Bulgaria-Baden-Wurttenberg, the Standing Committee Bulgaria-Bavaria (SCBB), and the Joint Research Centre of the European Commission. In the process of work are also included experts from different state and municipal structures, research institutes, civil society organizations and specialized companies. Valuable support and advices was received from MS experts.